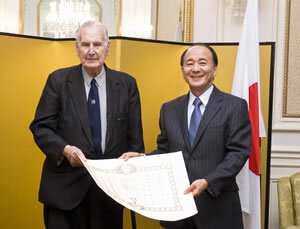 On 25 November 2010, Ambassador Shin Ebihara bestowed the Order of the Rising Sun, Gold and Silver Rays upon Mr Philip Malins, MBE, MC, chairperson of the International Friendship and Reconciliation Trust, for his outstanding contribution to post-Second World War reconciliation between the UK and Japan. Mr Malins, from Birmingham, is 91 years old. 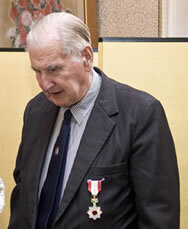 As a Second World War veteran who fought in the then Burma, Mr Malins, with recognition of the need to promote post-war reconciliation between the UK and Japan, undertook a number of initiatives and strenuously worked in concert with other individuals and organisations to facilitate dialogue between our two countries and bring about better mutual understanding and reconciliation. His initiatives include: the organisation of the annual reconciliation services at Coventry and Canterbury Cathedrals, the founding of the Anglo-Japanese Garden at the National Memorial Arboretum, and numerous publications and speeches made both in the UK and Japan on the theme of post-war reconciliation. Upon receiving his decoration, Mr Malins responded: 鐃緒申I am filled with gratitude and emotion in accepting this entirely unexpected honour in the presence of so many who have made outstanding contributions to reconciliation between Britain and Japan after the Second World War鐃緒申. He pointed out that, as there was no reconciliation after the First World War, which was followed only 21 years later by the Second World War, 鐃緒申reconciliation is the final victory for both sides鐃緒申.